A couple whose Essex home was one of five properties to be destroyed by a roof fire, have said they are coming to terms with being made homeless. Fire investigations are continuing into the cause of Wednesday's blaze in West Street, Harwich, which is not being treated as suspicious. Roger and Lavinia Hamer said they had lost almost all of their possessions. Mrs Hamer said: "I think we've just got to think about going ahead, starting afresh and carry on from there." Nobody was injured in the fire, which Essex County Fire and Rescue Service said had been fanned by strong winds across the roofs. None of the residents have been allowed to return to their 18th Century properties while fire investigators and structural engineers assess the buildings. Mr Hamer said: "It had a lovely feeling of history and we'd done our best to bring it back to the kind of historical house we felt it should have been. So it's very sad to see it all gone." "Next year we've got what we've called the Phoenix Project... we're going to rise from the ashes and make a new life for ourselves," he added. The couple, who are both artists, said most of their work had also been lost in the fire. Mrs Hamer said: "I've lost my studio, lost all my work, my sketchbooks going back 40 years that I was going to pass to my children which are like a record of our lives together. "We're going to have to make a completely fresh start from the beginning." 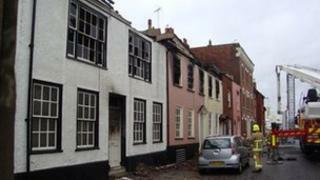 Tendring District Council said it was offering short-term support to all of the families affected by the fire. It also praised the efforts of local people and organisations who have rallied round to help those made homeless. One of them, Katrina Olive of the Home Grown Crafts shop, has set up a collection for people to donate items which will then be distributed. "It's been absolutely unbelievable," she said. "We're so touched by the community spirit in this town. It really has pulled together. "People have donated money, donated food, whatever they've got. Just so they've got the bare essentials to start again."